VIDEO: Poolside deck operation click here. Coach Dave Sheets – Duquesne University, 2018 A-10 Women’s Champions, A-10 Women’s coach of the year. 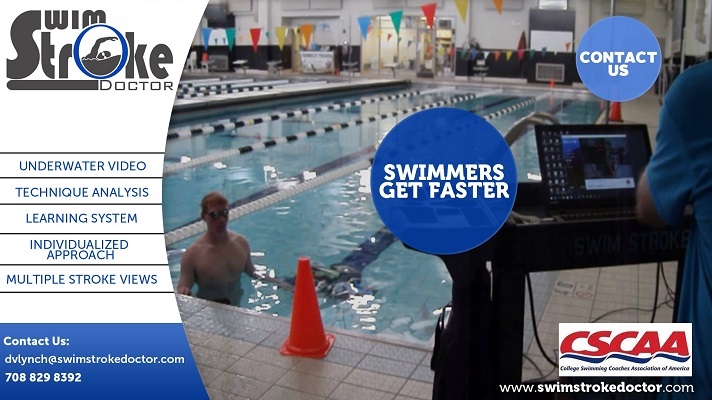 SWIMMERS GET FASTER WITH VIDEO – USING THE SWIM STROKE DOCTOR SYSTEM, YOU SUDDENLY BECOME COMPETITIVE. You need a particular kind of practice—video deliberate practice—to develop swimming stroke expertise. Video based deliberate practice is different. It entails considerable, specific, and sustained efforts on the components of the individual swimming strokes. Our system works from pool deck side, The Swim Stroke Doctor video system is by far the most versatile and easy to use system, swimmers love it. We study underwater the propulsive view of the stroke to make technique corrections. Video provides scientific support for swimming technique analysis for swimmers and teams. Technique review and swimmer stroke modification is easier with the Swim Stroke Doctor system. There are 15 technical parts used in competitive swimming 4 styles, 4 starts, 4 turns plus 3 turns of the individual medley. Video focus is personalized on the individual swimmers needs. Today’s swimmers are digital natives and learn visually. the Swim Stroke Doctor video lets them see, understand and make stroke corrections. We are here to HELP. Contact us to learn more about our system or to schedule us for a swimming technique clinic at your pool. CSCAA: We are proud to be a partner with the College Swimming Coaches Association of America. We are proud to have received Patent No. US 9,521,373, December 2016.